In this latest issue, the Iran Human Rights Review focuses on due process in the Iranian legal system. The review contains contributions from experienced human rights lawyers, activists and defenders. 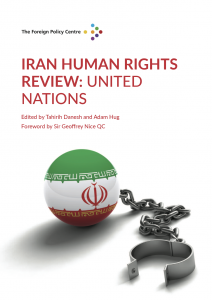 The Iran Human Rights Review: Due Process focuses on a number of key issues including the legal history of Iran and the current legal system of the Islamic Republic laws, with a particular focus on areas that either are in need of or are open to improvement to provide access to justice and ensure the legal system follows due process. The key arrears for improvement include resolving the tensions between Iran's national codes, its international commitments and its religiously inspired ‘qesas’ laws, with a particular focus on the use of the death penalty and juvenile executions. This issue invites both human rights critics of the Islamic Republic and the Iranian authorities to dispassionately and constructively examine the ways and means of improving access to justice for all Iranians through education and legislation.